As rebates get easier to collect, more shoppers are willing to go the extra mile to cash in, and that's why the app Checkout 51 has so much value. 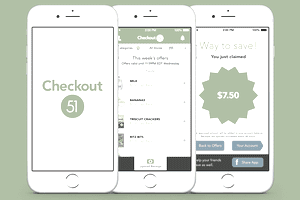 Checkout 51 allows shoppers to combine sales, coupons and these in-app rebates to maximize your value when you're buying groceries and other items. The following tips can help you save big when using the app, which is free for iPhone and Android phones. If you're not familiar with Checkout 51, you can read our beginner's tutorial here. Basically, the website and app offer its members the chance to earn cash back when they buy select products at their local grocery stores. Each week when you create your grocery shopping list, you'll want to look at Checkout 51 to determine whether any of the items you're already planning to buy are eligible for money back with the app. Checkout 51 updates its list of offers every Thursday, so if you create your grocery list on Wednesday night, re-check the app on Thursday morning to make sure the offers are still valid on the items you were planning to buy. If you're a savvy shopper, you're most likely combining sale prices with coupons (both mobile and paper) to get your groceries at a deep discount. You can continue to reap the benefits with Checkout 51 by matching the offers in the app to your coupons and discounts. Try to time your shopping and coupons with sales at local stores. It's not always possible, but sometimes the stars do align and you can get items you'd buy anyway at a great discount. As with any couponing or savings program, just remember that it doesn't really save you money if you're buying things on sale that you weren't already planning to purchase (no matter how tempting the deal might seem!). When you first create an account with Checkout 51, the app will ask if you want to enable notifications. If you do, the app will give you a nudge when new offers or deals are added to it. This is a good feature for the deals-savvy shopper, or even for those who need to be reminded to check their coupons before heading to the store. With the alerts enabled, you can stay up to date on the most valuable offers available at any given time. When you buy a participating product, you'll snap a photo of your receipt and upload it to the app. Make sure you do this for every participating item you buy, no matter where you purchase it because your savings can add up quickly. Once your balance hits $20, you can request Checkout 51 to send you a check for that amount, which you can use toward anything you'd like.